Every Sunday we always experience unscheduled brown outs. Most of the time, we find it inconvenient because it hinders us to do the necessary things that needs to be done. Two weeks ago, we planned to have dinner at my sister in law’s house. We were excited for the dinner but sad to say, at exactly 6:00 PM there wasn’t any electricity at all. We were gathered at the table using candle lights and couldn’t clearly see our food. Even though there are rechargeable lamps but it’s not so bright compared to using a brinkmann q beam. 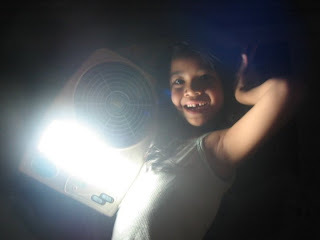 My niece wasn’t affected with the brownout and took her lamp and played with it. I brought a camera and she was posing in front of me even though it was dark. Below is her cute and funny photo. She has the potential to become a model… cute!